Good morning. 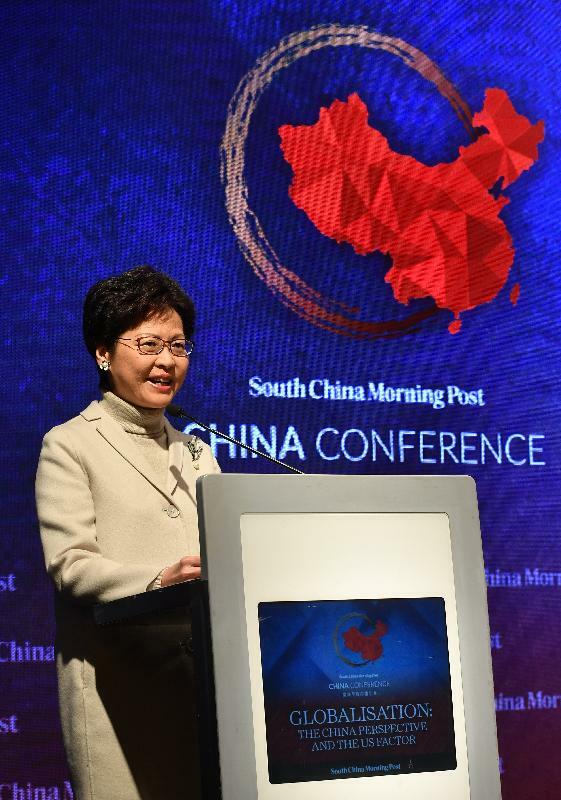 It gives me great pleasure to join you at today's China Conference organised by the South China Morning Post, the third edition of what has become a welcome annual thought leadership forum. Let me first take this opportunity to wish you all good health and happiness in the new year and hope that the world in 2018 will be a peaceful and fulfilling one. This year's conference theme - "Globalisation: the China Perspective and the US Factor" - underscores the eventful year we experienced in 2017. It articulates as well this year's - and, quite likely, this century's - two main protagonists in the global economic theatre. I must congratulate the SCMP for bringing together a list of distinguished speakers and panellists to share their insights including, in particular, Mr Daniel Russel, the former US Government Assistant Secretary of State in charge of East Asian and Pacific Affairs, whom I met when he was in office, and to have invited the Honourable C H Tung, who is the most highly regarded leader in town to talk about Sino-US relationship, to deliver closing remarks later today. It is hardly a secret that one of the two great economic powers has been dismissive of globalisation lately. Instead, under the flag of localisation, it has been aggressively promoting the politics of protectionism. Such an approach would undermine global efforts in promoting free trade, something which has served the world economy so well in the past decades. Thankfully, the majority of the world's economies continue to champion multilateral co-operation in trade. And Hong Kong, ranked as the world's freest economy, is clearly among them. Just two months ago, we signed a comprehensive Free Trade Agreement, together with an associated Investment Promotion and Protection Agreement, with the 10 member states of ASEAN. That is a clear and compelling vote of confidence in the power of free and open trade. We may also count Mainland China among the globalists as well. As General Secretary Xi Jinping said in his report to the 19th National Congress of the Communist Party of China in October last year, and I quote, "We should ... promote trade and investment liberalisation and facilitation, and make economic globalisation more open, inclusive and balanced, so that its benefits are shared by all." In a speech entitled "Seizing the Opportunities of a Global Economy in Transition and Accelerating Development of the Asia Pacific" delivered at last November's APEC CEO Summit held in Da Nang, Vietnam, which I attended for the first time as Chief Executive, President Xi said, and I quote, "The evolving global economic environment demands more from the system of global economic governance. We should uphold multilateralism, pursue shared growth through consultation and collaboration, forge closer partnerships, and build a community with a shared future for mankind. This, I believe, is what we should do in conducting global economic governance in a new era." More than mere words on paper, President Xi's embrace of economic globalisation, of connectivity and inclusivity, lies at the fast-beating heart of his visionary Belt and Road Initiative. Indeed, the Belt and Road is now supported by more than 100 economies and international organisations. Since its inception over four years ago, we know very well by now that the Belt and Road Initiative responds to the Silk Road spirit of "peace and co-operation, openness and inclusiveness, mutual learning, mutual benefit and win-win results". That vision offers a much needed response to the woes of today's international system. It believes that global prosperity lies in sharing growth and benefits, in putting the interests and the well-being of people at the heart of economic policies and plans. The Belt and Road Initiative promises improved connectivity in policies, infrastructure, finances, as well as enhanced ability to do business, to trade and to promote people-to-people exchanges. It offers expanded capital inflow and unleashed economic potential for all nations and regions along the Belt and Road. Hong Kong, traditionally an open and externally oriented economy, and enjoying unique advantages under "One country, Two systems", fits in perfectly with that vision and is well placed to contribute what we are good at to what the nation needs. The rule of law and our independent judiciary have long sustained Hong Kong's international success. Indeed, the annual survey of 2017 showed that 8 225 foreign and Mainland companies have set up offices in Hong Kong, among which 1 413 are regional headquarters and American companies account for a major part of that, representing a 2.5 per cent increase compared to the figure of 2016. That underlines our strengths as a development base, helping companies go global while attracting foreign investment. And we will serve as a professional services centre for the Belt and Road. While our financial services sector can help Belt and Road projects meet financial needs, our professionals can help carry them through. The infrastructure development being spearheaded under the Belt and Road Initiative is of historic proportion and generates demand for professional services in all sorts, bringing tremendous opportunities to financiers, bankers, lawyers, arbitrators, accountants, architects, engineers, planners, project managers, insurers, etc. In the process of "going global" under the Belt and Road Initiative, Mainland enterprises can make use of Hong Kong's one-stop and internationally recognised professional services to gear up their projects, while enjoying the high standards of our high-end professional services to reduce risks. Similarly, overseas enterprises can take advantage of Hong Kong's professional services in making investment in Hong Kong and the Mainland. Just last month, I signed on behalf of the Hong Kong SAR Government an Arrangement with the National Development and Reform Commission on Hong Kong's participation in and contribution to the Belt and Road Initiative. The Arrangement puts forward specific measures focusing on six key areas, namely finance and investment; infrastructure and maritime services; economic and trade facilitation; people-to-people bonds; taking forward the Guangdong-Hong Kong-Macao Bay Area development; and enhancing collaboration in project interfacing and dispute resolution services. Implementation of this Arrangement will allow Hong Kong to give full play to its unique advantages under "One country, Two systems" to continue contributing to the country, while at the same time seize those opportunities brought by the Initiative. As President Xi rightly pointed out, "Openness brings progress, while self-seclusion leaves one behind." I am confident that by joining hands together, the most can be achieved from the Belt and Road Initiative, and new drivers of shared economic growth will be created to counter backlash against open and free economy. On that note, I wish you all a very rewarding conference. Thank you very much.